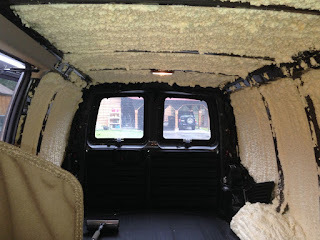 The most important aspect of creating a mould-free camper is the insulation. Here is the key point: no water vapour can enter the wall cavity. With exterior metal walls, as soon as you are heating the van to the point where the exterior wall will hit dewpoint, you have a serious risk of condensation and mould in the walls. So again, to keep it simple, no water can enter the walls if you plan to heat your camper when it's cold. In Camp Like a Girl, Sara uses some XPS and some EPS insulation. XPS is a vapour barrier (meaning no water can pass through 1.5 inches), and EPS is not. So using XPS foam is one option to insulate your van. XPS or polyiso with foil backing are usually tolerable for most people with MCS. However, just the foam on its own will not be airtight. You can use canned spray foam to fill in the gaps if that is tolerable for you. It is not chemical-free but I have found it odourless once dry. Handi-Foam is the safest one, as it is GreenGuard Gold certified. 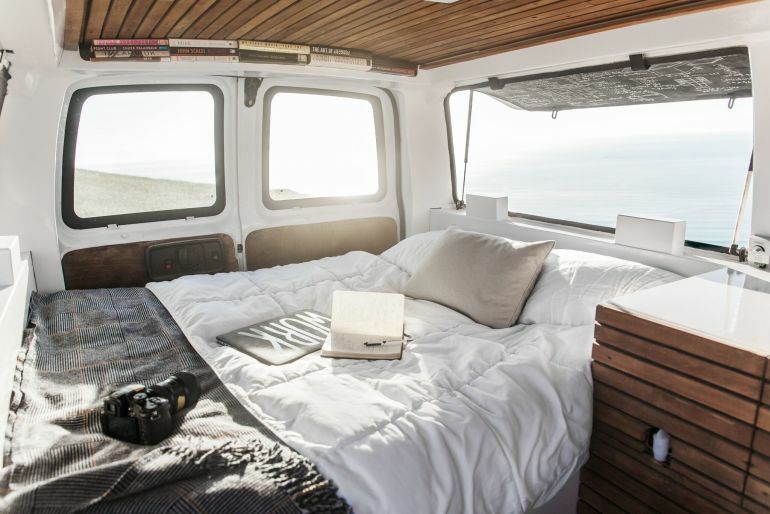 A good way to go about it is - if it's warm enough - to sleep in the van empty and slowly work on insulating and building it out. The other option is to get it all done and then wait for it to offgas. Camp Like a Girl also uses insulation in the bed platform to keep the bed warm. I would be a little concerned here with flame retardants in the foam. If your bed is raised you could use cork insulation from Thermacork below you, but you need slats under a typical bed (unless it's an air mattress etc.). More on protecting beds from moisture in the last section. Spray Foam is in theory your safest bet for preventing mould, as the foam will get into every crevice and form an airtight layer that will prevent all moisture from getting into the walls. The best spray foams are Heatlock Soy line at Demilic (GreenGuard Gold certified) and Icynene Proseal (GreenGuard Gold certified) (closed cell). Both are polyurethane foams, from reputable companies that are usually easy to source. It must be closed cell, which is a vapour barrier. I recommend these to healthy people who are set on spray foam. I don't usually recommend them to people with MCS because I have heard bad stories (and there are better options for most homes). In theory, they do not offgas, but I hear many many stories from moderately sensitive people that this does offgas noticeably in buildings. A small sample may air out quickly, but test this in a building before using it. At least two years (if this is installed correctly) may need to be scheduled in to offgas this for the moderately sensitive. If not installed correctly it's a goner. If you are mould sensitive but not chemically sensitive you could consider this in a van. Metal is your safest bet unless you are putting the plastic covers back on. This all depends on what kind of van it is, as they are all different. For an extra layer of protection, caulk around the seams to prevent moisture from going into the walls. I have also seen gaskets with solid silicone sheets used to make something airtight (I don't know how well that worked but it's an idea to throw into the pot). Sara used PVC ceiling tiles which are toxic, but real tin ceiling tiles could be used as a non-toxic alternative which add a fun look to your camper. While The Vanual looks very pretty with its wooden ceiling, I would avoid plywood as walls, ceiling or subflooring. There are just too many points where the wood hits the metal. If you are intent on getting this look, you would have to have lots of insulation at all the metal ribs to make sure dewpoint would never be hit. If that is possible, then you could use plywood with strips of wood over it to get the look in The Vanual. I wouldn't feel comfortable using wood to raise the floor joists as the wood right against the metal could be a recipe for condensation and mould. Rigid foam may be your best bet for floors to solve the thermal bridging there. Or else spray foam between the joists and then use metal flooring. Different flooring materials could be considered - metal, which could be painted with different designs for a pretty effect, or covered with rugs, or Marmoleum which is very tolerable (be careful here as Marmoleum has jute backing, use an underlayment with a thermal break). You could also cover metal with EVA mats, woven vinyl that's phthalate free, or hard vinyl plank like Armstrong brand. You could use wood if you are sure you have enough insulation underneath to prevent condensation from forming under the wood, a thermal break, and that the wood can withstand high humidity. MgO board could be used as subflooring here if you are using Marmoleum or wood. The MgO will crack though. Sara and the Vanual used plywood for their bed bases. If it's softwood plywood it needs some time to offgas formaldehyde. The other option is Purebond plywood (I would non moisture resistant wood species in a van or small trailer ever). It also doesn't let the mattress breath. Mattresses are very susceptible to becoming damp in campers, even in a house never put a regular bed on a solid surface. It would be best if the bed base was made of planks/slats that allowed some airflow. The bed should be flipped and checked often for dampness, especially if you cook or shower inside. Even better, in such a humid environment cover the mattress with a waterproof protector before installing it in the camper. This one is highly tolerable. The other option is to use a bed that doesn't transfer moisture and doesn't mould like this well tolerated TPU air mattress (takes only a couple days to offgas to my standards). I now use the thickest Thermarest which is more comfortable than an air mattress for me (took a week or so to offgas enough for me) - this still needs a waterproof cover or to be raised off a flat surface. I would use bedding made of polyester or wool blankets made for the chemically sensitive (and not cotton) because of high humidity in vans. For cabinets, if you do use plywood, go for a formaldehyde-free plywood like Purebond (moisture resistant wood types only) or use solid wood (which may warp in high humidity). You need fans that move air out - one above the shower if you have one, and one in the general space. My CampLite had two fans and we still have problems just with cooking humidity making the mattress wet. The standard camper fans are called Fan-tastic. The Vanual has some cool tips for solar power, wiring and appliances. If you want to go off-grid you will need solar and you generally you will need to tolerate a fuel stove. The Vanual and other van owners speak highly of Goal Zero solar systems because of how easy it is to install. Some people just use the solar charger outdoors. The other option is to wire the van to plug into a campground plug (or modify to plug into a house), this would allow you to cook on an electric hotplate and would allow an electric heater. Right now I use an Instant Pot to cook everything and I release the steam outside. This is a really good way to reduce moisture in a van or little trailer. You can cook almost anything in that. Using an electric blanket is a good heating option to save energy. When I camp in a tent I use an electric blanket and it provides a lot of warmth. The best kinds are the large ones with the 10 hour shut of time to keep you warm all night. You may not need a space heater if it's not too cold where you are. For off the grid heaters I would go with the rooftop propane heater/AC combo that many trailers have. Though extreme mould avoiders have said these can get mouldy. One other way to avoid propane is to run systems off the diesal of the van. I like this YouTube video because it gives a good overview of the whole process and how complex it is. With a few tweaks, this van could also be very suitable for a chemical or mould sensitive person. If the insulation is sealed up perfectly by the Reflectix and tape, then no vapour will pass through. If you have a high enough R-value to keep the wood walls from getting condensation then this could work. (You would still want to use a wood that holds up well to high moisture areas). Here is an example of a fully decked out custom van made for someone with MCS (you would want to see how the construction was done if you wanted to copy or buy this one). Disclosure: Some of the links to products and supplies on this page go through my affiliate partners. As an Amazon Associate I earn from qualifying purchases through the Amazon links. Thanks for all the ideas. If you want to spend a ton of money on a product with questionable reliability go with Goal Zero. Otherwise put in your own battery, charge controller and solar. Definitely do not buy solar panels from Goal Zero - at 4 times the cost of other panels. Hey Cort! Thanks for the feedback. Everyone I know building a cargo van camper is using Goal Zero! Any idea why? Hi, Corinne--I think that it's appealing to people who are unfamiliar with and intimidated by setting up a 12-volt system, because it's plug-and-go. While it is convenient (until it breaks), I agree with Cort that it's WAY overpriced. For the money one would save, one could hire a consultant to put together a nice little solar system. Also, I've had such bad experience with their customer service that I wouldn't buy any of their products again, personally. Thanks for the info on solar. Not my area of expertise! Wow! Its too awesome man. 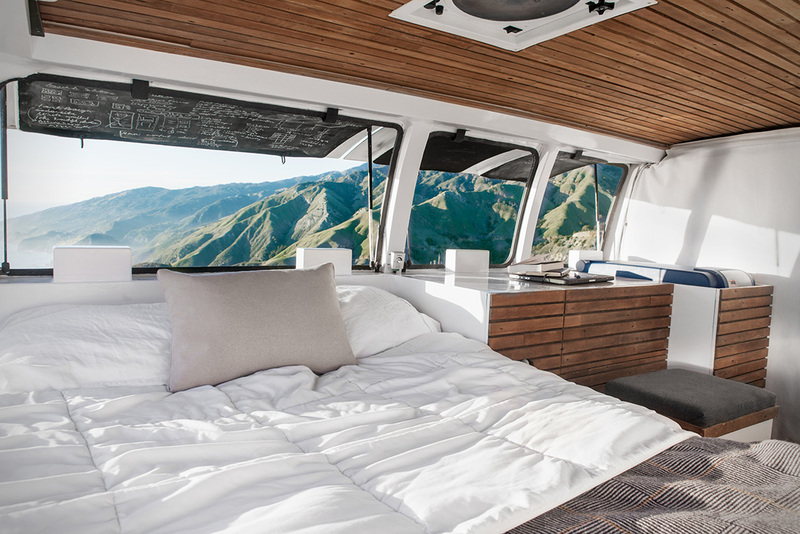 The way you have converted the cargo van into beautiful camper is mind blowing. You have made me your fan. I really need your autograph!